This is a Z-Wave Controller for Europe. To run this device please connect it to your mains power supply. 1. Connect the HUB to your local network using Ethernet cable. 2. Power up the controller. After up to 2 minutes the HUB is ready to use and the white LED will breathe normal. Now you can connect your computer or mobile device to the new WIFI Popp-xxxx (xxxx=last 4 digits of MAC address displayed on device label, WIFI-password on label, too). Attention: For security reasons, the initial configuration is available via WIFI only. Later, you will have more options. 3. Point your browser to http://192.168.115.1:8083. If you use a mobile device, install and start the Popp HUB app (Use the QR code on page 4). 4. The welcome screen displays your unique device ID. Remember it for remote access! Define your access password for the default login name ‘admin’ and your email for password recovery, set your time zone and LAN access (otherwise you can only access using find.popp.eu and using WIFI). 5. In case there is a firmware update you will see a message screen. Please confirm and update the firmware. Make sure not to un-power the device during the firmware update. 6. Now you can access your controller from outside your home, too, using the service find.popp.eu. Use DEVICE_ID/LOGIN (e.g. 12345/admin) and your password. 7. Start adding Z-Wave devices and apps and have fun. To add your first Z-Wave device, go to ->Configuration ->Devices ->Z-Wave ->Add New and follow the instructions. 8. You can later change your device‘s time zone and allow access to the hub user interface via the Ethernet address. Please go to ->Setup ->Applications ->Active and change settings in "Time Zone and Access from WAN" app. Z-Wave is the international wireless protocol for communication in the Smart Home. This device is suited for use in the region mentioned in the Quickstart section. Z-Wave ensures a reliable communication by reconfirming every message (two-way communication) and every mains powered node can act as a repeater for other nodes (meshed network) in case the receiver is not in direct wireless range of the transmitter. This device and every other certified Z-Wave device can be used together with any other certified Z-Wave device regardless of brand and origin as long as both are suited for the same frequency range. If a device supports secure communication it will communicate with other devices secure as long as this device provides the same or a higher level of security. Otherwise it will automatically turn into a lower level of security to maintain backward compatibility. For more information about Z-Wave technology, devices, white papers etc. please refer to www.z-wave.info. Sensors, switches, thermostats, cameras and many devices more will make you home intelligent. But all these components need a central controller. 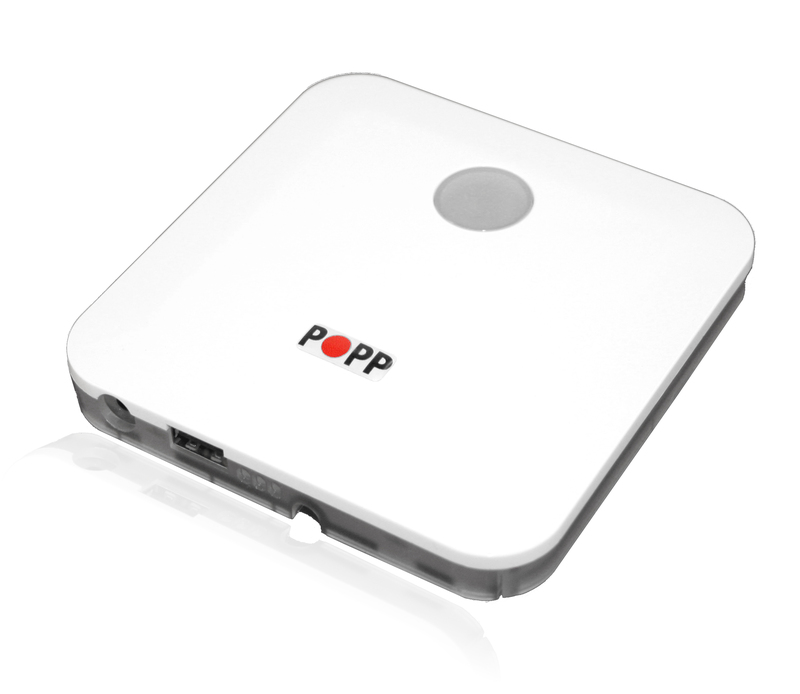 The second-generation POPP HUB is a slim and compact IP smart home gateway, equipped with Z-Wave wireless technology. Therewith you can control your whole home automation network via remote switches, smartphone, desktop and tablet pc. Inside one network the POPP HUB controls up to 230 Z-Wave components manufacturer-independently and allows management of direct connections (associations) between the devices. These associations can be used also without a central gateway. The latest POPP HUB hardware generation is still more flexible. Beside already installed WiFi and Z-Wave technologies the HUB can integrate further technologies such as EnOcean via internal and external USB ports. The POPP HUB enables you to control your home centralized and flexible ? and without any wiring effort. The HUB works with Z-Way, the fist Z-Wave Plus certified Z-Wave controller software, which also connects devices with different technologies with each other. The POPP HUB is focused on easy operation and reliable security architecture. Therewith it is one of the most secure smart home gateways generally. Thanks to the integrated device database and step-by-step instructions any new smart home device can be connected quick and easy. The POPP HUB?s big advantage is its capability to integrate all certified Z-Wave devices with all of theirs functions. Other gateways block some device functions by itself. By using so-called apps from the continuously growing app store, you can setup a lot of automation scenes in no time. So, you can switch your sockets time scheduled, dim lights depending on current brightness or heat up your home to your comfortable temperature by only one push of a button. With the free POPP HUB smartphone and tablet app, you can control your home also from outside. Please read the user manual before installing the product. In order to include (add) a Z-Wave device to a network it must be in factory default state. Please make sure to reset the device into factory default. You can do this by performing an Exclusion operation as described below in the manual. Every Z-Wave controller is able to perform this operation however it is recommended to use the primary controller of the previous network to make sure the very device is excluded properly from this network. This device also allows to be reset without any involvement of a Z-Wave controller. This procedure should only be used when the primary controller is inoperable. ATTENTION: only authorized technicians under consideration of the country-specific installation guidelines/norms may do works with mains power. Prior to the assembly of the product, the voltage network has to be switched off and ensured against re-switching. On factory default the device does not belong to any Z-Wave network. The device needs to be added to an existing wireless network to communicate with the devices of this network. This process is called Inclusion. Devices can also be removed from a network. This process is called Exclusion. Both processes are initiated by the primary controller of the Z-Wave network. This controller is turned into exclusion respective inclusion mode. Inclusion and Exclusion is then performed doing a special manual action right on the device. Here are a few hints for network installation if things dont work as expected. Make sure a device is in factory reset state before including. In doubt exclude before include. If inclusion still fails, check if both devices use the same frequency. Remove all dead devices from associations. Otherwise you will see severe delays. Never use sleeping battery devices without a central controller. Controller — is a Z-Wave device with capabilities to manage the network. Controllers are typically Gateways,Remote Controls or battery operated wall controllers. Slave — is a Z-Wave device without capabilities to manage the network. Slaves can be sensors, actuators and even remote controls. Primary Controller — is the central organizer of the network. It must be a controller. There can be only one primary controller in a Z-Wave network. Inclusion — is the process of adding new Z-Wave devices into a network. Exclusion — is the process of removing Z-Wave devices from the network. Association — is a control relationship between a controlling device and a controlled device. Wakeup Notification — is a special wireless message issued by a Z-Wave device to announces that is able to communicate. Node Information Frame — is a special wireless message issued by a Z-Wave device to announce its capabilities and functions.